LASER CUT: The laser beam cuts completely through material along the designated path, creating polished, high quality edges. We can cut Paper, wood, acrylic, ABS, delrin, cloth, leather, matte board, Mylar, fabrics, cardboard and more. LASER ENGRAVE The laser beam vaporizes material to a user-controlled depth, creating a flat surface with a high quality finish. We can engrave anything we can cut PLUS Brick, glass, marble, slate, granite, and anodized aluminum. 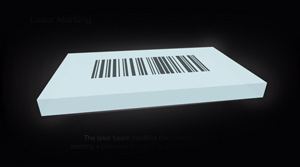 LASER MARKING: The laser beam modifies the material surface, creating permanent marks without removing material or impacting surface integrity. Our Lasers mark metal items using CERMARK. Read Universal Laser's White Paper for more info on laser processing of materials. Setup charge (software, graphics, etc.) is $75.00 per hour with a minimum of one hour. Setup includes a proof part for customer sign off before production is started. Proof parts are created on material of our choice, typically ¼” plywood or acrylic. For custom quotes, laser time starts at $2.00 per running minute with a $30.00 minimum. If fixtures are needed, they are charged on an as needed basis, based on time and materials. This machine is AMAZING! It cuts 1/2" thick acrylic, engraves stone and glass and processes CERMARK. This laser can accomodate items up to 24" x 18" x 7"
Plexiglass (acrylic) is a versatile material that has great impact strength yet is light weight with exceptional optical quality. Acrylic (plexiglass) is 10 times stronger than glass and half the weight. It is widely used for a number of applications such as cut lettering for signage, engraved edge lit signs, back-lighting, glazing, displays, picture framing, custom computer cases, aquarium tanks, and much more. We process a LOT of Acrylic. 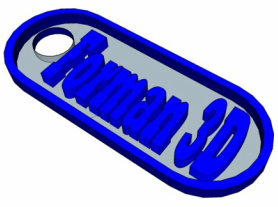 We can cut up to 1/2" thick acrylic and can engrave any piece that fits in our lasers. We are now carrying quite a few colors to make your custom parts. These are all cast acrylics and available in a variety of thicknesses including 1/8", 3/16", 1/4", 3/8" and 1/2"
Transparent colored plexiglass is capable of passing light through the material making it possible to see through. White #3015 is classified as an opaque plexiglass acrylic sheet. Opaque sheets transmit either a negligible amount of light or no light at all. White #7328 is a solid sheet, but will allow some light through. There are many uses for white #7328. 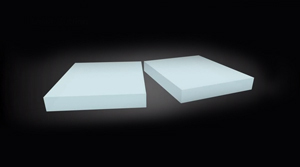 It is an excellent material for applications that need to be back lit, such as back lighted signs or displays. White #2447 will also allow some light through (more than white #7328). White #2447 is often used for applications that need to be back lit, but which need more light to transmit through the material (for example: photo light tables, lighted drawing tables, x-ray chart readers, overhead lights, skylights). 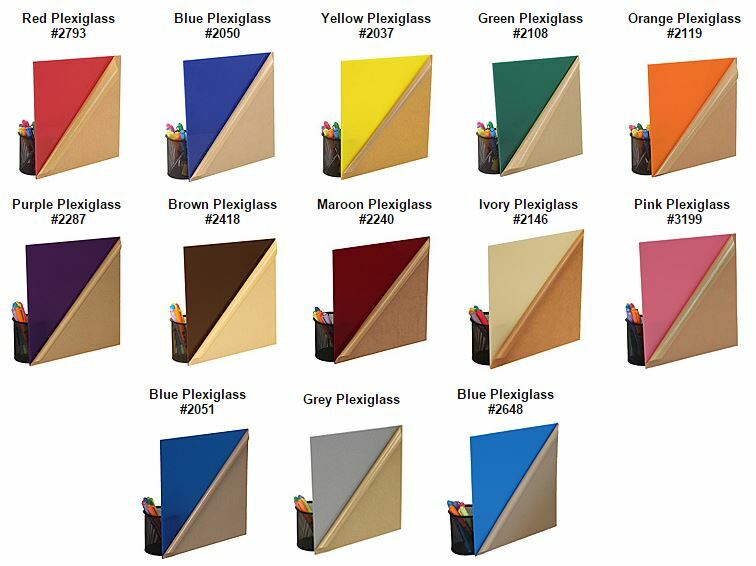 Non glare P99 plexiglass has a matte finish on one side to reduce glare which makes it very popular for picture framing and poster framing. The matte finish diffuses light striking the surface which helps to reduce glare. For best results, the sheet must be placed against or a small distance away from the picture or artwork. This is not a window glass. Acrylic Mirror is light weight and ten times stronger than glass. It is an excellent choice when safety is a consideration. Unlike regular glass, acrylic mirror does not shatter into small sharp pieces when broken. Need some inspiration for your project? Our blog is always being updated with the most recent projects we helped create.